Maybe you have noticed that we recently presented a new online casino here at Free Bonus. This casino is called Casino Cruise and this casino was launched last year. Already Casino Cruise have received a couple of prestigious awards for their innovative site and the wide variety of games. We have tried the casino a lot during the last weeks and we must say that we are impressed. Few other casinos offer as much campaigns and promotions as Casino Cruise do. On top of it all Casino Cruise have an exclusive no deposit offer that you can claim if you sign up through us. If you want to try your luck at Casino Cruise you know have the possibility to do this for free. 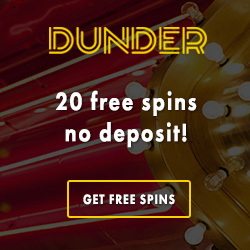 Just make sure you sign up through our site and you will get 20 free spins on Starburst. These free rounds will be available for you on Starburst the following day by 12 pm. 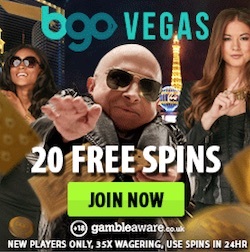 The best part is that these no deposit free spins are totally free from wagering requirements. This way you get to keep anything you win with your spins. Casino Cruise has a lot more to offer than just no deposit spins. When you start depositing money to this casino you can claim a welcome package filled with both bonuses and free rounds. 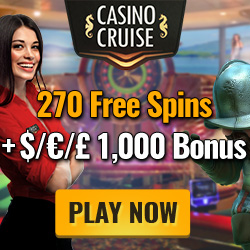 In total you can claim €1100 in bonuses and 270 free spins on Starburst. You will be rewarded with all this in connection to your four first deposits to Casino Cruise. Just make sure you accept the bonuses before you make any deposits. 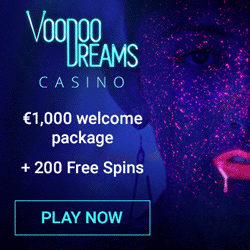 To claim both spins and casino bonus you must deposit at least €20. 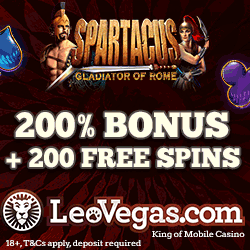 All bonuses will be paid out straight away while the free spins are credited to your account the following day. Claim your welcome offer at Casino Cruise! This Tuesday there is also a interesting pool party going on at Casino Cruise. You can join the pool party straight away and claim a generous reload bonus that will give you more money to play with. To get this bonus you simply have to make a deposit to Casino Cruise and select the bonus. If you do this you will get no less than 25% extra on your account up to €100. So, for example if you deposit €100 you will get a balance of €125 instad. The promo is running until midnight so make sure you claim your pool party bonus before that!